If there's one thing we prefer to do with our heifers, it's dehorn them. We've had cows with horns, and believe me, life is much easier without them. We usually don't bother dehorning the steers since they invariably have a date with the freezer when they're about two years old, and our philosophy is: Why waste a perfectly good dehorning on a steer? But heifers become cows, and cows are generally with us for a long time, so we find it's best if they don't have horns with which they push others (including us) around. 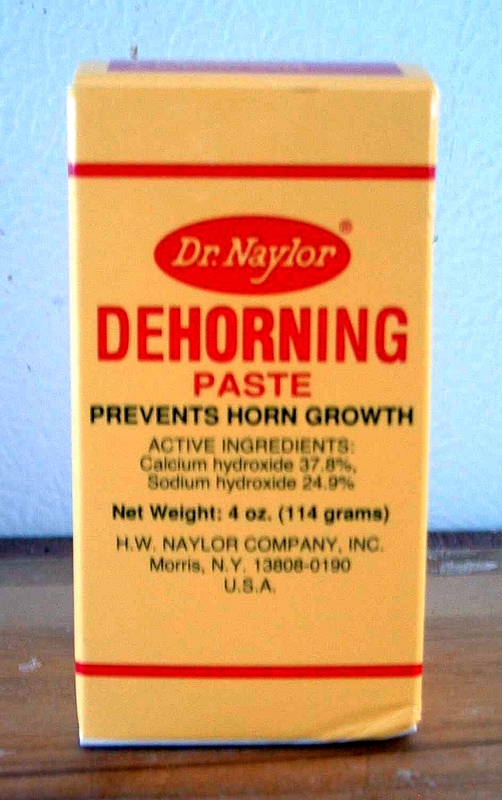 We use dehorning paste. 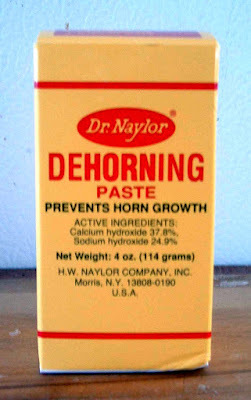 Another thing we learned (the hard way) is dehorning paste has a shelf life. 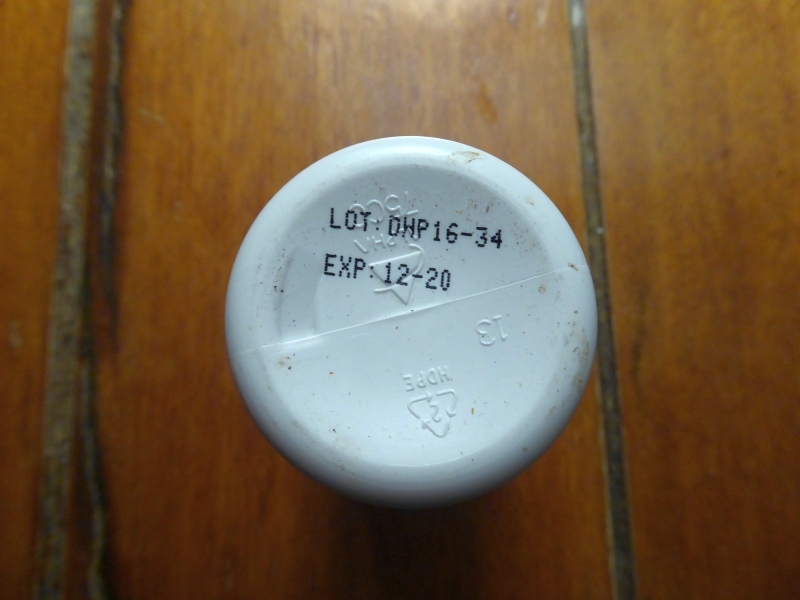 Always look at the expiration date. We needed fresh paste this year, and at the feed store I noticed they had some paste expiring in 2018, and the rest in 2020. Guess which I picked up. The first thing we needed to do was get Sparky and Hickory inside the barn, where we could separate out the calf into a smaller pen. In the absence of farm hands (i.e. 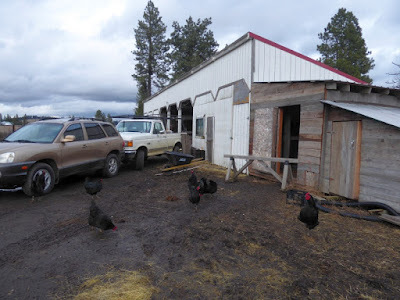 our daughters), Don and I parked the vehicles to form a funnel toward the barn door. It worked. 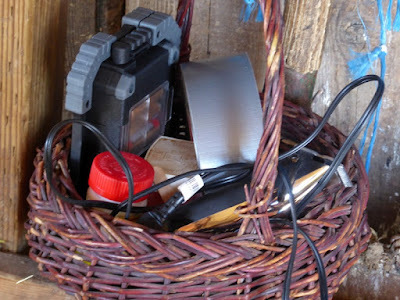 Then we assembled our dehorning kit: Hair clippers, Vaseline, Popsicle sticks, dehorning paste, duct tape, and a light (it's quite dark in the pen). The hair clippers are to shave away the hair over the horn buds; the Vaseline is to draw a circle around the buds to corral the paste; the Popsicle stick is used to apply the paste and keep it off our hands; and the duct tape is to keep the paste from getting on the mother, either her tongue (from licking at the calf) or her udder (when the calf nurses). There is a fairly small window of opportunity for using dehorning paste on calves. It's best used when the baby is between three and ten days old, and the little horn buds can be felt under the skin. One time we were going to dehorn a calf, but for the life of us we couldn't feel her horn buds; so rather than risk applying the paste and damaging her skull, we waited a few more days until the buds could be felt. Here's the light we used to illuminate the pen where we worked. A friend gave us two of these lights. 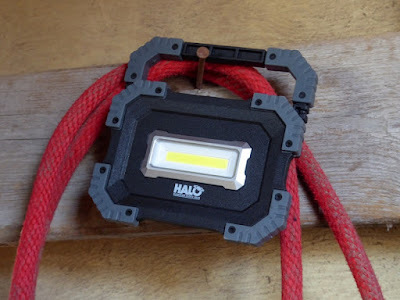 They're very bright -- 500 lumens -- and can be propped up or hung up. Very nice to have. Both of us had our hands way too full to take photos of the actual dehorning procedure (if you're interested, we have an ebooklet on the process here), but it went fine even with Sparky bellowing at us nonstop right outside the pen. Distressed cows are LOUD. As soon as Hickory's head was wrapped with duct tape, we released her to her mama, who instantly calmed down. Many calves understandably fight the duct tape, but this little girl was very calm the whole time it was on. 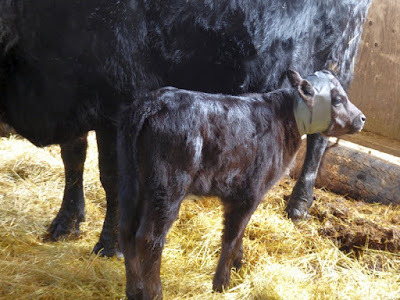 We left Sparky and Hickory in the barn all day until late afternoon, at which point we separated the calf once more and clipped away the duct tape (this takes about 30 seconds). Then we released both mama and baby back outside. What I like about dehorning paste is it's both aesthetic and painless (at least, if the calf's behavior is anything to go by). As soon as Hickory was released from the barn, she was galloping and skipping around in typical baby high spirits -- and we can look forward to a cow who will never develop horns. 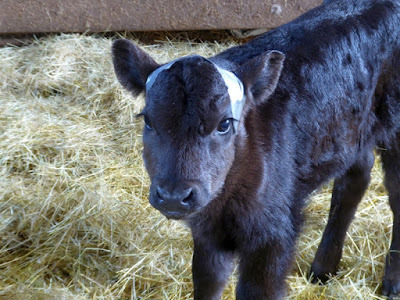 Since we're keeping little Ferdinand as a bull, we'll also be dehorning him in the next few days as well. Ahhhhh... look at those loooooong eyelashes. She's the cutest thing. This is fantastic! I have wondered about that paste. Great Blog Thanks Patrice! Ps. they are adorable!! We raised Polled Herefords, but we'd still occasionally get a calf with horn buds, so we always checked them and used the paste. We used it on steers, too, as we sold some of ours and horned steers would bring less, even though they were headed straight to slaughter. I guess it was just an excuse for them to pay less. We raise polled Mini Herefords so thankfully don't need to do any dehorning. Animals large or small with horns can be a nuisance. We do dehorn our Mini Alpine Dairy goats using a horn burner to disbud them at just a few days old. Quick and easy. 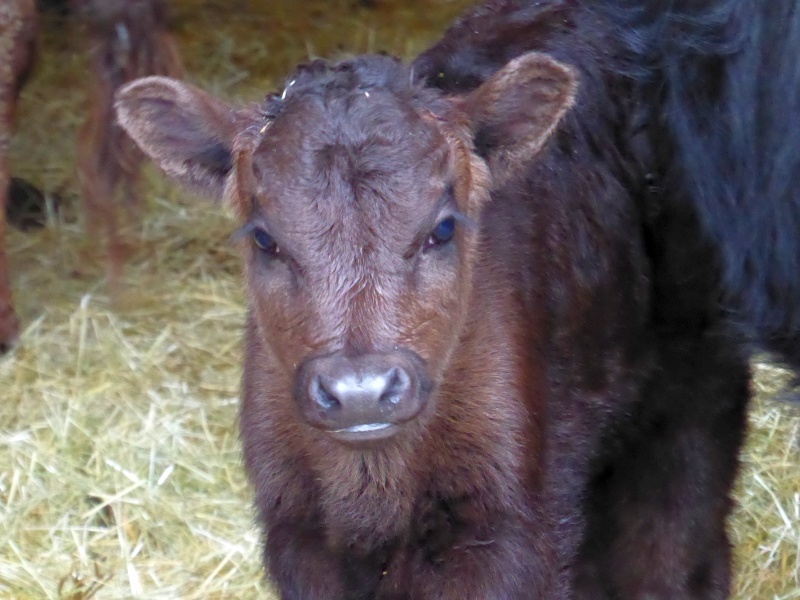 Always fun to have new babies on the farm. So far this spring at Creekside Farmstead we have 2 sets of twin lambs with more on the way any day. Thankful for the nicer weather here in SE Washington as well.